Boy what a week it’s been! You’ll recall from last week how Peeps and I were both having mother issues – his mom came through her surgery just fine and is feeling well enough to, well, she’s kind of giving the hospital staff a rough time, so I guess that’s a good sign, right? My mother had her procedure, too, and, fortunately she didn’t have to be admitted to the hospital, and both my parents spent Friday evening and Saturday morning with us before heading home. And of course, Saturday morning included a trip to the Public Market – I not only got my regular produce and eggs, but I got a flat of cute little violas for this year’s window boxes (Mother helped me pick them out). I do still have to get a few more plants – some hangy stuff and maybe something a little taller. . . then I’ll get everything properly planted. But for now, aren’t they cute? The perennial portion of the herb garden is, well, it’s perennial, huh? 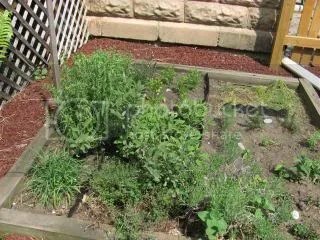 I did divide the thyme and the oregano a couple of weeks ago, and next year, I may do the same to the tarragon and the sage. Maybe even the lavender. Meanwhile, the new stuff – dill, basil, rosemary, and a couple more parsleys – are settling in nicely, so I guess we can have plenty of fresh herbs to look forward to this summer. We came home from visiting Peeps’s mom Saturday evening, and we were TIRED and HUNGRY – it had been a long day (week) and it was well past dinnertime. 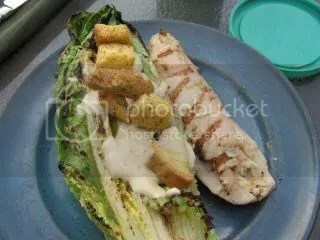 As it happens, one of the things I picked up at the market was a package of romaine hearts, and the current issue of Cook’s Country featured a grilled Caesar salad which sounded quite good. While the recipe includes homemade dressing (and, of course, I had to make the mayonnaise before I could make the dressing!) anyway, I’m sure a decent bottled caesar or creamy parmesan dressing would work just fine. The deal was – you cut the lettuce in half, leaving the core in to hold it together, and then brush the cut side with dressing before slapping it on the grill. That’s right – grilled lettuce. AND, since we had some leftover roasted chicken breast, I figured it wouldn’t hurt anything to give a couple of slices of that meat the same treatment – brush with dressing and reheat it gently on the grill. It was the perfect late, light dinner, and, even making the dressing from scratch, it came together in well under half an hour. 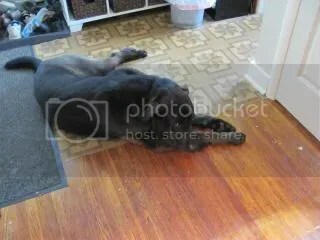 I do still plan to get rid of that gosh-awful linoleum tile in the front entry – even though I have no idea what kind of shape the hardwood will be in when I do. Since it’s such a cruddy job, and my discretionary time seem to be somewhat limited lately, I’ve decided it may work better to just clean up a dozen or so tiles at a time – I have to scrape the tiles off, then remove what appears to be a double-thick layer of some sort of adhesive, then I need to thoroughly clean up the solvent that actually softens the glue. Someday, the floors will need to be refinished anyway, but for now, I think I much prefer the spotty, paint-spotted, and scratched hardwood to the awful plastic tile or, even worse, that fugly old blue carpet. And I think Jar agrees. And once again, it’s time for the weekly menu plan. We still don’t know what the Peeps’s Mom Situation will be, so we’re going to try to keep things as manageable as we can. Although it’s looking to be a spring-like week, it’s also looking like we may see a bit of rain, so . 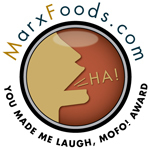 . .
Monday – Between a late day at work, forgetting to pre-prep the meal, and hospital visits, we ended up putting off last week’s falafel, so we’re going to remedy that right away. The falafel mix is made and in the fridge, as is the dough for whole-wheat pitas. Tuesday – While we were rummaging in the freezer looking for shrimp (which we did NOT find), we did come across one last package of Chinese pork, all cut into cubes and ready for a batch of fried rice. Okay. Wednesday – And since we’re pre-cooking rice for Tuesday, we’ll do a little extra for some (meatless) veggie burgers we noticed while thumbing through the current Bon Appetit magazine. And again, the dough for honey-whole wheat burger rolls is also made and in the fridge. Thursday – Seasonally warm weather notwithstanding, while we were digging in the freezer, we found a smoked pork shoulder that Peeps had put aside for his favorite meaty beans – that’ll probably also be another future dinner and several lunches, I’m sure. Friday – And as always, it’s pizza night. At this point, we don’t know what the head count will be, but I’d imagine that even if Peeps’s mom doesn’t make it over for pizza, she’d probably not mind some delivery! Your meal plan sounds yummy. I need to work on mine! Thanks, Becki! Besides the fact that it’ PIZZA night (! ), it makes menu planning so much easier to know, by the time we get to Friday and have run out of ideas, that this one’s done. 🙂 And yeah, the grilled salad was surprisingly good! As awful as that tile is, I think the PINK linoleum my mother picked in the 50’s was worse. Ask Peeps, he’s seen the god-awful stuff. Now we have a beautiful ceramic tile that’s heated (Yay! Warm toes!) And thanks to Sandy, all the pink in the basement is getting painted over. There was a lot of pink in the 50s, wasn’t there? Kind of like there was a lot of avocado green in the 70s. . . This house, I think, was a big 80’s house – an awful lot of Country Blue. Ack. Not related to this post, but I don’t want to search for the one it relates to: here’s a place that sells hand-spun yarn. And it’s in Arkansas, yet! 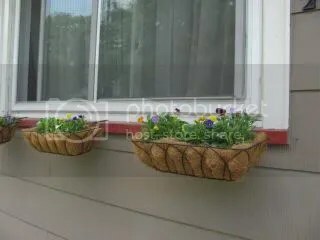 Related to this post, inspired by your window box plantings — I’ve seen a project with guttering nailed to wooden fences, filled with dirt, and lettuce, herbs, etc., planted it it. Looked right cute, and hey, no bending over to pick! I really like your window boxes! Diverse week with hospitals, moms, floors (I see Jar is a BIG help), cooking and planting. Looking good. I finally got some drapey-viney plants to go with the flowers – they’re so cute!